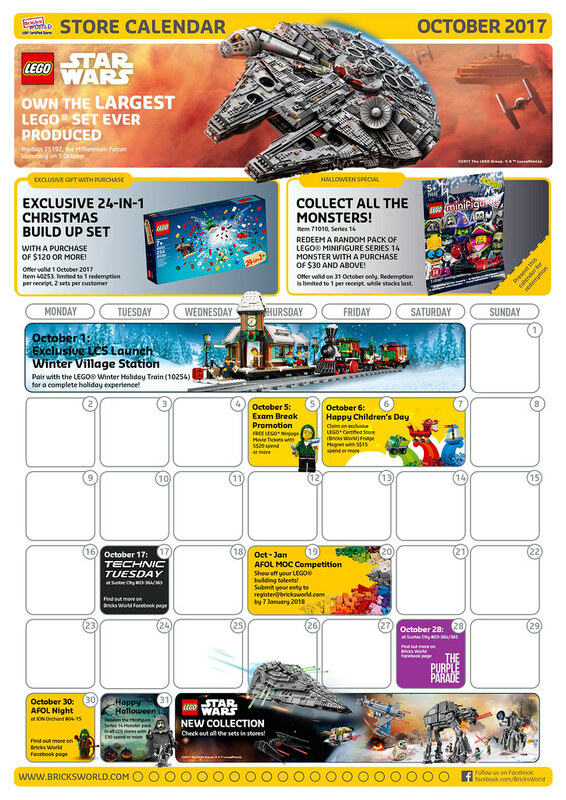 The LEGO Certified Store Calendar for October is out now at all Bricksworld LEGO Certified Stores around Singapore and there are quite a bit of activities and freebies for the month of Halloween. October 1-31st: LEGO 24-in-1 Christmas build up. 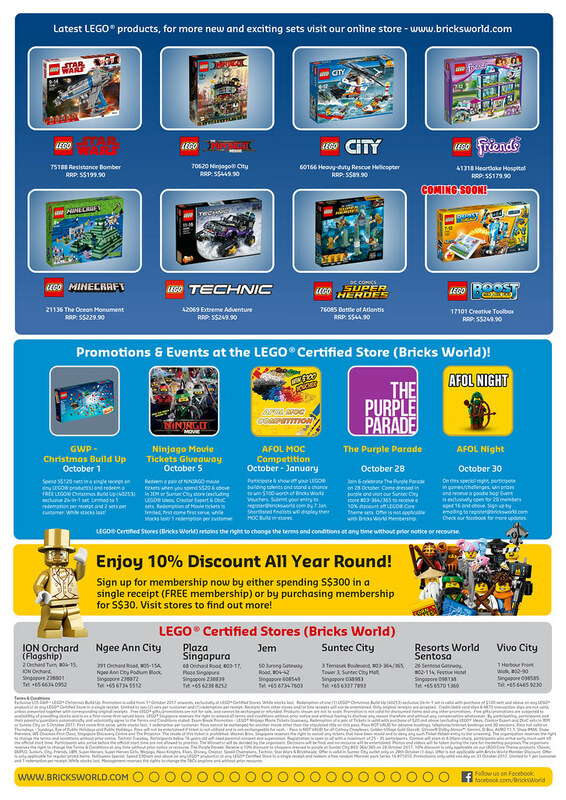 Spend a minimum of SGD$120 on any LEGO products on a single receipt to redeem one. Maximum 2 per customer. While stocks lasts. October 5th: Free LEGO Ninjago Movie Ticket when you spend a minimum of SGD$20 on LEGO products (exclusing LEGO Ideas, Creator and D2C sets). One per customer while stocks lasts. Only for JEM and Suntec City stores. October 6th: Happy Children’s Day. Redeem an exclusive Bricksworld fridge Magnet when you spend a minimum of SGD$15. October to January: AFOL MOC competition. Submit your entries by January 7th to stand a chance to win SGD$100 of Bricksworld LEGO Certified Store vouchers. October 17th: Technic Tuesday. Race technic cars to win a prize! October 28th: The Purple Parade Celebration. Enjoy 10% discount off all products at the Suntec City Store when you dress in purple. October 30th: AFOL Night! Come celebrate the end of the month with fellow AFOLs from your community. You can read more about the previous AFOL night here. October 31st: Happy Halloween! Redeem a Collectible Minifigure Series 14 packet when you spend a minimum SGD$30 or more.